2 parents looking for more than pasta for dinner on a Friday night during Lent = Baked Feta and Tomato Shrimp dinner. With a bag of frozen shrimp in the freezer and a couple pantry and refrigerator ingredients, our Friday night dinner was on the table in 20 minutes. Baked Feta and Tomato Shrimp had all the flavor of a restaurant quality dish without the added expense of dining out. I like to eat out just as much as the next person, but when making a delicious entree is so simple, it was just as easy to eat at home. 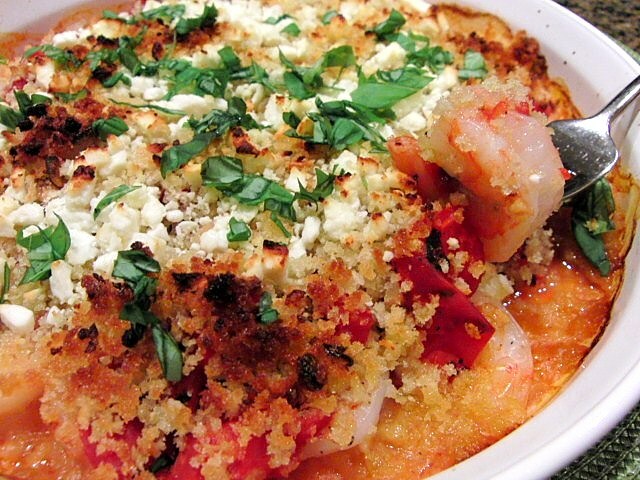 Baked Feta and Tomato Shrimp is loaded with garlic panko crumbs, fire roasted tomatoes , jumbo shrimp and salty feta cheese. With a loaf of crusty bread and a salad of mixed greens with balsamic vinaigrette, dinner is complete. Enjoy dinner at home tonight. Your wallet will thank you. This recipe is just as tasty as one from your favorite seafood restaurant. It can be made up to the point of just before roasting and stored covered in the refrigerator for up to 6 hours. Add a couple extra minutes to the roasting time if putting the entree directly from the refrigerator to the oven. In a small saucepan over medium heat add butter and olive oil. When butter begins to just bubble, remove the pan from the heat and add the garlic. Let sit for 3 - 5 minutes. Add the panko and stir to combine. Set aside. Brush a 9-inch baking dish with a little olive oil. Add the shrimp and sprinkle with the salt and pepper. Top with the tomatoes, the garlic panko and sprinkle the feta. Bake for 12 minutes or until the shrimp are just cooked through. Remove from oven and top with the basil. This looks so easy and sounds so yummy. I'm definitely going to try this one out soon. Lovely dish and at Greek seafood tavernas - this is called Shrimp/Prawn Saganaki. Nicely done! feta and shrimp sound so good together! I love the idea of adding ricotta cheese to marinara sauce! I'm going to keep that in mind next time I'm looking for a quick change to a simple meal. Absolutely amazing and so simple. REALLY different!